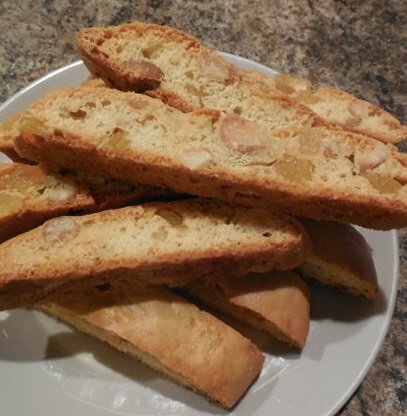 These Almond Anise Biscotti have a very traditional Italian taste that goes well with a glass of sweet desert wine or a hot steaming cup of coffee. 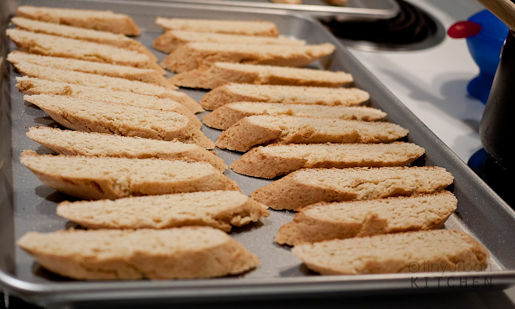 Biscotti have become very popular in the US recently, but the Italians have been baking them for years. 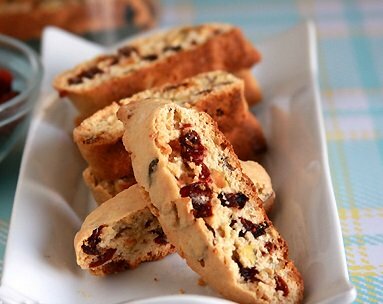 I have been only been baking for a few years, but now that I've started using this recipe, Italian friends tell me that my biscotti “taste just like their Nanas"—and I'm not even Italian. It is a lovely recipe with a subtle anise flavor. 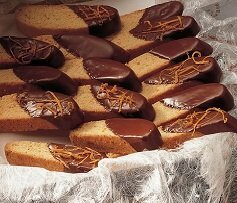 Just what a classic "cup of coffee biscotti" should be. I personally prefer it with less sugar and more anise, but my in-laws with more mainstream tastes like it best just as is. I also found it better to reduce the heat for the second baking as my oven tends to burn the bottoms, but that may just be my oven so I did not change the recommendation. If you prefer you can substitute a teaspoon of anise extract or a few drops anise oil (more about oils) for the seeds. Line and large baking sheet with parchment paper or silicon baking sheet and set aside. Place one oven rack in the middle of your oven and preheat to 350 degrees F.
In a large bowl beat sugars and butter until well blended. Add anise seed and eggs and blend well. I a separate bowl whisk together the flour, baking powder and salt. Add the dry mix to the wet and mix just until blended, fold in the almonds. Turn dough out onto a floured surface and knead briefly, dived into two equal pieces and shape into 2 rolls 10 x 1- inch. Place rolls 4-inches apart on prepared baking sheet. Flatten each to 2-inch width. Place into oven and bake at for 20-30 minutes or until golden brown. Remove from oven and cool completely, transfer to cutting board and cut diagonally into 1/2-inch slices. Arrange slices, cut side down, on ungreased cookie sheets. Return to oven and bake at for 6 to 10 minutes or until bottom begins to brown. Turn and bake for an additional 3 to 5 minutes or until crisp. Remove from oven, transfer to cooling rack and cool completely. *Flavoring oils are the essential oil squeezed from the ingredient itself like the oils from the vanilla bean, oils from the almond nut, etc. Oils are much more concentrated and intense than their extract and their flavor is often more pure and clear-tasting. The oils are really fantastic when you want that specific flavor to really shine through. If you would like to try some really great flavored oils, I highly recommend those sold by OliveNation.